I promised, to share my recipes for the delicious homecooked western cuisine. I will start with the appetizer first. This considers a cold dish as I’ve served the prawns chilled, and this idea was adapted from the first dish, the cold platter, which commonly served in some occasions/ events e.g wedding banquet dinner or something like that.. And this chilled prawns are usually served with fruits salad. So, I was inspired to came out with the vegetable version, hoping to create a slightly more balanced diet. You may also add more types of vegetables, for instances, peas, asparagus, Cauliflower and etc, to make a vegetable medley. Sound good (winking smile)? 1) Bring a pot of water to a boil over high heat. Add salt and sugar to dissolve in the boiling water. 2) Blanch broccoli florets and carrots till 90% cooked. Use a strainer to transfer the vegetables out from the boiling water, and plunge into iced water for 10 seconds. Then, return the same to the boiling water for another few seconds. Dish up the vegetables and place on a serving dish. Set aside for later. 3) Use the same pot of boiling water, now, blanch the prawns till pinked. Drain, and place the prawns in the refrigerator to chill for about 20 minutes. For fast chilled, place into the iced water for few minutes. 4) Heat frying skillet/ pan with olive oil over high heat. Return the broccoli and carrots into the pan for a quick stir-fry, about 30 seconds. Sprinkle salt and black pepper and stir fry to mix well, before heat off. Then, sprinkle and melt grated cheese on top of the vegetables. Dish up and plate on a nice serving dish. 5) Before serve, top vegetable with more grated cheese. Then, arrange chilled prawns on top of the bed of cheesy vegetables, and top with mayonnaise dressing. Serve. 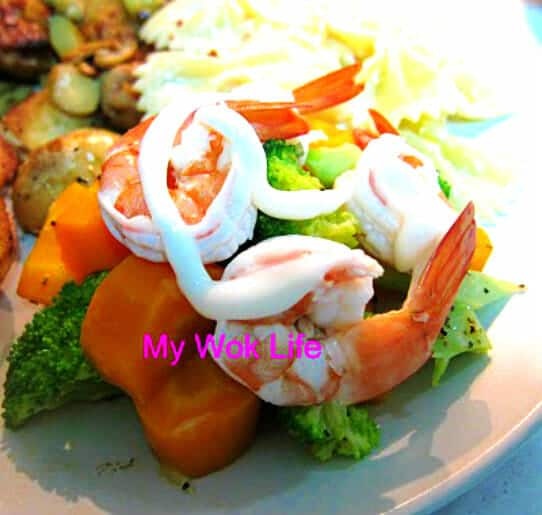 A portion of cold salad prawn with cheesy vegetables dish counts about 230kcal. Tips: Use Dutch Edam cheese for milder and nutty cheese taste while Italian Parmesan yields more cheesy with slight buttery taste which is good as topping. *Remove broccoli first from the blanching, once it is almost done as carrots take longer time to get soften. Do not over-boiled the vegetables. The broccoli should not appear too soft and too dark in its greenish colour. Plunge into iced water is to retain its crunchiness. * If you like, toss to coat the prawns with mayonnaise instead of topping it, before placing on the vegetables.